British photographer David Breen has photographed the Aurora Borealis, using his Canon 5D Mark II DSLR. Seeing the Northern Lights in Britain is a rare opportunity, but there have been a few reports of them being visible in the North East of England and Scotland over the past few days. The camera was used with a Canon 24-70 f/2.8mm, with David telling us that he shot at f/2.8, with an average sensitivity setting of 1250-1600. He did however push the camera to its higher limits, shooting at ISO 12,800. "I never normally go anywhere near that higher setting," he said, "but the results show surprisingly little noise." Using an average exposure time of around 20-30 seconds, Breen said that he performed very little post-processing work on the image once he got home. "I shot in raw format, so I used Camera Raw with Adobe Photoshop CS5 to process the image, but I didn't enhance the saturation or vibrance. I tweaked the contrast slightly and used noise reduction a little, but otherwise it's pretty much as shot. " 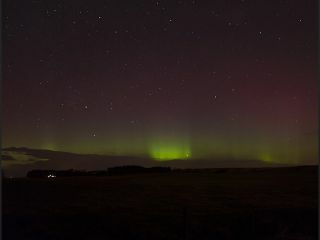 Breen, who describes himself as an advanced enthusiast was tempted to head out into the night to capture the phenomenon after seeing Tweets about it online. He says he feels very lucky to have been able to capture the lights, this coming at the end of the night as he was already on his way home. "I packed up my gear and I was driving along, when I saw some stripes from the passenger window. I abandoned the car on the roadside and got out and prayed they would last." This is only the second time David had tried to capture the lights, telling us he felt "very, very lucky" to have been able to photograph them. Since posting the images online, they've also been featured in a variety of news outlets, including Sky News and Wired Online.